Edwin S. George, born in Slatington, Pennsylvania in 1873, was educated in the public schools of Morenci, Michigan. He moved to Detroit in 1890 and took employment with Annis and Miller, a downtown furrier. By 1897, he had his own wholesale and retail fur trade. His first venture in the vehicle industry was as proprietor of Standard Auto Company. I do not know what products they produced. Businessman Edwin S. George capitalized upon opportunities in Detroit’s emerging vehicle industry and in the city’s real estate development early in the Twentieth Century. In 1900, Woodward from Grand Circus Park to Warren provided space for impressive churches and elegant residences such as the Whitney Mansion that now serves as one of the city’s prestigious restaurants. George was the developer responsible for introducing commercial activity to this span of Woodward. 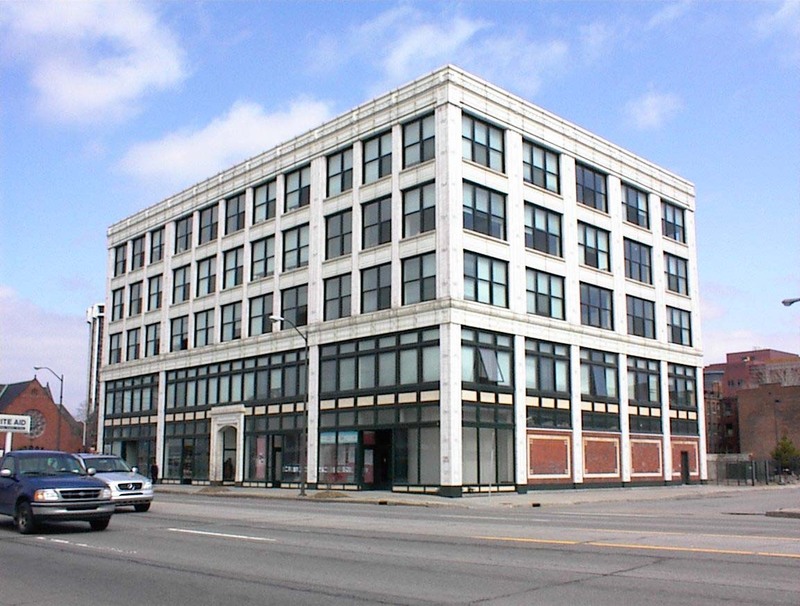 In 1908, he had Albert Kahn design a two-story building that would offer rental space to auto parts suppliers and manufacturers. These are the first two floors of the building pictured above. Kahn designed a nearly square building with a flat roof. To embellish the side facing the city’s most important thoroughfare, Kahn used white glazed terra cotta. Note the impressive entry way on Woodward and the attractive windows. Although this was an industrial building, the embellishments that Kahn added indicate that Edward George wanted a distinctive and distinguished building worthy of its location on the city’s most important street. Those decorations enhanced the appeal of this structure when it was converted into residences almost a century after Kahn completed his design. Brick walls are exposed on the other three sides as was typical for industrial buildings of that era. In 1914, George had three additional floors added, but in an architectural style that was entirely consistent with the lower ones. Looking at this building reveals no evidence that it was erected in two stages. I do not know if the additional stories were used as offices or for light manufacturing. When the height was increased, the name was changed to the Garfield Building, presumably because it is located at the corner of Woodward and Garfield. In 1942, Edwin George sold the structure to a real estate investment firm. Wayne County Community College occupied this building in the 1970s, but it then stood empty for some years. Later, the process of converting the building to condominiums began and, by 2006, it became known as the Lofts at Garfield.